International Skeptics Forum - View Single Post - [Merged] "Iron-rich spheres" - scienctific explanation? Thread: [Merged] "Iron-rich spheres" - scienctific explanation? I would like to remind you all that the RJ Lee Group did a thorough study of the WTC dust using state of the art technology, and you all did not. "Various metals (most notably iron and lead) were melted during the WTC event, producing spherical metallic particles." Note they clearly said that Iron melted producing spherical metallic particles, not office furnishings burned producing spherical metallic particles. The common tactic here is to sidestep or jump over this fact and ask about thermite. One step at a time please. First come to grips with the scientifically verified fact that iron melted. Funny you should mention the R. J. Lee Group. Turns out Ron Wieck recently asked RJ Lee about the iron microspheres and their formation. I attach a statement by Rich Lee in regards to the iron sphere issue. As you can well imagine, we at RJ Lee Group believe that it is extremely important that good science is done and that the public knows the difference between good and bad science. Rich and I will be available for a brief phone conversation with you if you wish. If so, you can suggest a time frame Monday or Tuesday (we’re in the Eastern time zone) as we will not be available this afternoon. We wish you success in this matter. Well, let’s start with the basics. 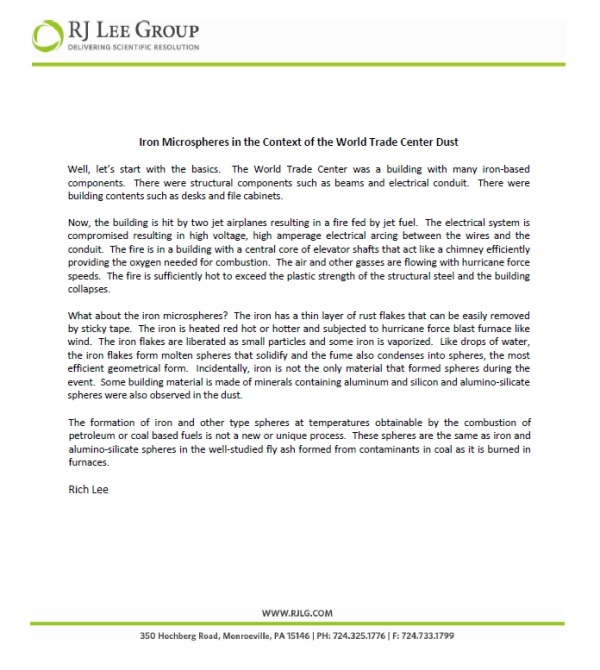 The World Trade Center was a building with many iron‐based components. There were structural components such as beams and electrical conduit. There were building contents such as desks and file cabinets. Now, the building is hit by two jet airplanes resulting in a fire fed by jet fuel. The electrical system is compromised resulting in high voltage, high amperage electrical arcing between the wires and the conduit. The fire is in a building with a central core of elevator shafts that act like a chimney efficiently providing the oxygen needed for combustion. The air and other gasses are flowing with hurricane force speeds. The fire is sufficiently hot to exceed the plastic strength of the structural steel and the building collapses. What about the iron microspheres? The iron has a thin layer of rust flakes that can be easily removed by sticky tape. The iron is heated red hot or hotter and subjected to hurricane force blast furnace like wind. The iron flakes are liberated as small particles and some iron is vaporized. Like drops of water, the iron flakes form molten spheres that solidify and the fume also condenses into spheres, the most efficient geometrical form. Incidentally, iron is not the only material that formed spheres during the event. Some building material is made of minerals containing aluminum and silicon and alumino‐silicate spheres were also observed in the dust. The formation of iron and other type spheres at temperatures obtainable by the combustion of petroleum or coal based fuels is not a new or unique process. These spheres are the same as iron and alumino‐silicate spheres in the well‐studied fly ash formed from contaminants in coal as it is burned in furnaces. OK, here's the RJ Lee Group talking about the formation of iron microspheres in WTC dust. I didn't see anything about "thermite." Can you point out where Rich said "thermite" was the only explanation?